Get Top Brands for Less! 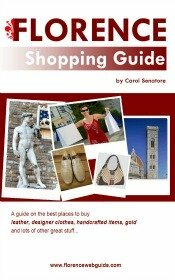 Cheap designer clothes are difficult but not impossible to find in Florence. Your best bet for finding exclusive labels for less is to go to stockhouses and outlet stores in town. (Out-of-town outlet villages are another option, but that's another story.....). Most outlets are able to sell for less because the items in the store are not from the newest collection but might be from the season before. Stockhouses on the other hand often buy in bulk and large quantities so they get better prices. Stockhouse and outlet dealers are always on the lookout for great bargains on the most sought after designers (Gucci, Prada, Dolce & Gabbana, Max Mara, etc) and often carry a wide assortment of top labels. 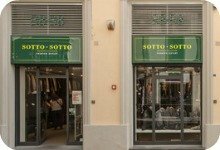 Sotto Sotto is a new large outlet store which carries the most important and prestigious Italian designers. on the glamorous shopping streets, they certainly don’t want it to be advertised that their goods can be bought at an outlet store in town. For this reason, it is considered inappropriate to advertise the actual names of the labels that ‘Sotto Sotto’ carries. Suffice it to say, this store has all the ‘Big Ones’. The store carries clothes for men and women and also a large selection of designer bags, shoes and accessories. Prices: in the higher range due to the prestigious brands the store carries. Save however 50 – 60% compared to regular retail prices for the same pieces. One of the most prestigious stores in all of Florence is called Luisa via Roma. Luisa Contemporary is the exclusive outlet store for Luisa via Roma and sells clothes and accessories from the previous season. For the most part, prices are very high since even at a 30% or 50% discount these articles still can go for €200-300 or more (and for Luisa standards that's cheap!). However, I did find several pairs of jeans at around €100 and there were some summer tops for around €70 the last time I was there. Clothes for men & women in modern and even avant-garde styles.